Throughout the history of Formula 1 there have been many examples of very public and acrimonious fall-outs between team-mates. Lewis Hamilton and Nico Rosberg isn't quite Prost-Senna, Piquet-Mansell or Villeneuve-Pironi, but they are definitely not the easiest pair of drivers in F1 to handle. All credit to the Mercedes management. Because of their very open style, they have been able to manage their egos. So far. Hamilton is the biggest star in F1. Rosberg is a very talented racer, who you feel after performances like we saw in Mexico is on the cusp of great things. Take Hamilton out of the team and we could well be hailing him a two-time world champion. Quite apart from the battles on track, there is a lot going on between these two guys at the moment, and it's fascinating to watch. Hamilton is far from averse to making little digs at Rosberg. There was the comment after winning the US Grand Prix, when he said he was "your worst nightmare" as a team-mate. Then the remark after Mexico when he said Rosberg had "driven really well today, no mistakes, no gust of wind" - a reference to the reason Rosberg gave for his decisive error during the race in Austin. There is a real subtlety to those remarks, much more Prost than Muhammad Ali, and that makes you realise there is a much greater awareness there than Hamilton sometimes lets on. Hamilton's argument with his team in Mexico over whether he should make a second stop for tyres was evidence of the mind of a serial winner. He has not won three world titles and 43 races by always being in the best car, even if that is exactly what he has right now. He has an instinctive understanding and spatial awareness of what is going on in a race. He had seen Rosberg pit. He was feeling good on his tyres. He knew from the strategy the team went into the race with that they were planning to do a one-stop race. And then they told him they were on Plan B. He was thinking: "Hang on a minute. Why are we on Plan B? I can go Plan A. I have track position now. If I stay here I could have a better chance of winning." So he questioned it, and left the team hanging in the pit lane for a whole lap. It took the firm action of Lewis's engineer to sort that out - and full credit to Peter Bonnington for that, because it cannot be an easy situation to deal with. From the outside, we can easily read into it that Mercedes wanted to take the risk out of the race, neutralise it between the two drivers and keep it all fair and square. If they had allowed Hamilton to go on and make only one stop, and he had gone on to win the race, then the very real risk was that all relationships would have broken down within the team. Since then, Hamilton has thrown out some crumbs about the team working hard to make Rosberg feel supported. I knew about those comments only when I read them on Tuesday morning, but in that context it is very interesting to look back at the behaviour of the Mercedes team after the race. When Suzi Perry and I were in the garage interviewing Rosberg, some of the team were around him cheering: "NICO, NICO, NICO." I'd never seen those songs of praise with Hamilton, despite an obvious joy at being part of a winning team. At the time, I thought it was Rosberg's car crew giving him the support they feel for him. But, in the context of Hamilton's remarks, I wondered whether the team had been briefed to celebrate extensively if Rosberg won. However, I am told that is not the case - and I highly doubt they would be that cynical. I doubt Hamilton would say what he did if it was not based on some fact. He is not a scaremonger. He either acts on briefing or on knowledge. He is not a fantasist, in the way some famous drivers seem to have been. How will it affect Hamilton and Mercedes? Hamilton had to trust in his team during the race in Mexico. But equally he was right to question the call to pit. The team will not be upset by the fact he questioned them and left them hanging. You need that volatility and absolute hunger in a driver. The ones who respect every decision are not pushing every area - there is an edge to the very best drivers that enables them to be as successful as they are. Hamilton will know exactly why it was done. They will have had a frank conversation about it privately and Hamilton will know all the information and whether he could have made it to the end on those tyres or not. If the information says the tyre wear was beyond prediction, he will say: "Fair enough, you made the right call." If it shows there was potential he could have made it, he may well say: "OK, next time, either tell me that you want me to do it because you want us to hold station, or I will make the call based on what I think is right at the time and suffer the consequences." Hamilton made a very pertinent point when he said there was no longer a championship at stake, so why not take the risk? Equally, Mercedes would be quite right to argue: "Listen, if we give you a winning car, you are employed to finish either first, or second behind your team-mate, and we are not prepared to risk negative media by taking unnecessary risks. So you will take the instructions." Most driver contracts say you have to take the reasonable instructions of the team principal or a senior member of management. But next time, Hamilton may well say: "I'm taking it into my own hands, I will accept responsibility and take the flak if it goes wrong, but the upside of it is if I get it right, I will win." If the team say: "We're not prepared to take that risk," he can say: "OK, if that's our risk profile why don't we slow down our chassis and engine development as it might go wrong?" As always it's a subtle yet crucial line that either allows for blue-sky creativity or just joining the dots of engineering knowledge. Which is unlikely to see you have an edge over the competition. It's clear that Rosberg arrived in Mexico on a mission. There was a directness in his statements to his engineer, and a hunger in his driving, which showed an absolute desire and intent that I have not always seen. The end result was he delivered. But - and we have said this many times before - the bottom line is that he needs to do that more often. Hamilton can be quite difficult when things are not going well. But he has worked himself into a position of living a lifestyle that right now is delivering for him. He has built a comfort zone of lifestyle and position in the team that is only now beginning to filter out. 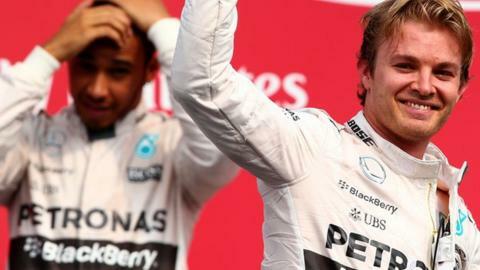 Rosberg refused to say in Mexico whether he was going to change his approach to Hamilton in the wake of Austin. He denied he had been motivated by anger. He denied he had the bit between his teeth any more than usual. I can relate to that. What I remember from my career is that you are so wrapped up in what you're doing, it is so intense, that you cannot see the wood for the trees. I remember sometimes going into a media briefing and saying things like: "Before you even mention this, it's not the case." You just know someone is going to bring it up, so you try to head it off. But all you're doing is confirming you're aware of it. Even if it is not as big a deal as the media might make it, it remains a topic for discussion. Drivers are not that sensitive to general observations around us. But when we feel something is unjust, it really gets to us. An example for me would be a number of times when I felt Michael Schumacher had done something that was beyond sporting conduct - and if I beat him afterwards, as in France in 2001, for example, it felt that much better. So I can understand Rosberg's frustration after Austin, where he felt he had been pushed wide at the first corner. I still maintain Hamilton did nothing wrong there. Rosberg can say and think what he likes, but he was on the outside, and that is the danger zone - as we saw with the collisions between Valtteri Bottas and Kimi Raikkonen in Russia and Mexico. Both times the guy on the outside came off worse. Hamilton is entitled to take his line, and if Rosberg stays on the outside he has to accept the consequences.